Do you live in Orlando, FL, or another similar "flatland"? Apparently, there is a classification of information that might be considered 'Mountain Knowledge,' that isn't common knowledge to a Flatlanders. Here are some helpful tips for Floridians heading to the Mountains. Vibram recently came out with their Fivefingers V-Series of minimalist footwear and they're now available at Travel Country Outfitters in Orlando, Florida. New models include the V-Alpha, V-Aqua, V-Run, V-Soul, V-Trail, V-Train, V-Trek. These styles allow your to choose precisely what they're looking for in a barefoot shoe. If you read more of my blogs, you’ll notice a pattern about me and cold weather. I live in Orlando, Florida because I really hate being cold. That’s why I love the Arc’teryx Atom AR Jacket; it lets me love the mountains. I took the Arc’teryx Atom AR to the Grand Tetons back in May. Forgetting that May in Wyoming is nothing like May in Florida! In Florida, in the month of May, the population doubles from tourists seeking refuge in the warmth. In Wyoming, in the month of May, kayak rentals are closed because the water is still dangerously freezing. When I started looking for a new rucksack, I had three primary requirements. I needed firm hip-belts and a supportive back structure due to a previous shoulder injury that made backpacking difficult. I wanted to be able to access the center of the bag without having to unload its guts and I wanted the bag to be both versatile and easily organizable. I would be using it for international travel and road trips so ultralight was less of a priority than reducing the weight on my shoulders. I’d lived with a 35 liter for a few years but now I needed to fit more than my sleeping bag, camping pad, and tent in it. In the world of wallets, we hadn't seen anything new in decades. Today, cash is used infrequently while debit and credit cards have become the payment standard. Finally, a company in Holland has decided to take their leather to the next level. Secrid has engineered a unique line of wallets; all engineered to provide easy access and scanning protection for your cards. Have you been dreaming about your Big Green Egg as the centerpiece of an amazing outdoor kitchen? 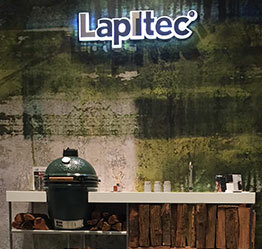 We have, and Lapitec S.p.A, made that dream a reality. Handling Winter Properly in the U.K.
Over the course of the last 3 years, I’ve spent 3 months in London. But this trip was going to be different, it was going to be in the winter. And WHAT could you possibly do in the UK winter? Wanna hear the story of how an Outdoor Research Transcendent Sweater, a pair of Vibram Fivefingers CVT Hemps, and a pair of Mountain Hardwear Power Stretch Gloves literally saved my skin in Norway? Good. I’d love to tell the tale.